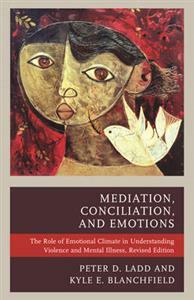 Mediation, Conciliation, and Emotions: The Role of Emotional Climate in Understanding Violence and Mental Illness, the revised edition of the groundbreaking Mediation, Conciliation, and Emotions: A Practitioner's Guide to Understanding Emotions in Dispute Resolution, discusses the under-researched topic of emotional climate, and emphasizes the importance of considering climate or environment when trying to understand violence and mental illness, as well as its impact on our society. Ladd and Blanchfield describe how an effective mediator, conciliator, or peacemaker should approach these conflicts. New features include updated references, a discussion of contemporary violence and mental health, and comparisons between culture and climate when determining how conflicts evolve into violent acts.